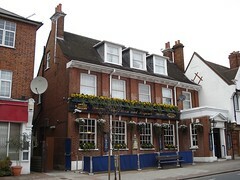 Fairly standard Wetherspoons pub in Hatch End. There's standing room, bar stools, and a couple of sofas right at the front near the bar, a few booths further in, and a dining area at the back. Kake visited on a Thursday afternoon in March 2009, arriving around 4pm. There were plenty of other customers in, and a nice buzz of conversation. A TV opposite the bar was showing horseracing with the sound on. The five handpumps on the bar offered four guest ales, priced at £1.89/pint (though the Woodforde's Sundew was off) plus London Pride, and there was a sign on the wall inviting people to suggest future guest ales. The barman happily gave me a generous taster of the Brentwood Hope and Glory, and it was fine. Kake's verdict: Neither the smartest nor the scruffiest Wetherspoons I've ever been in; it's probably somewhere in the middle. Nothing special at all, but it does the job. Accessibility: One step up to get in, didn't notice an accessible toilet. Last visited by Kake, 12 March 2009. Opening hours take from the J D Wetherspoon website, March 2009. Last edited 2013-05-10 07:35:47 (version 3; diff). List all versions. Page last edited 2013-05-10 07:35:47 (version 3).